Is it just me or does Command Ops Pro sound like a name for a trail camera that wouldn’t be the bare bones, entry level model in a company’s line of cameras? Or maybe if you see Command Ops Pro as the lowest level camera you will think that the higher end cameras will be mind blowing in their quality? The Command Ops Pro is the most inexpensive and basic trail camera that Browning makes. Depending on what your particular needs are for a trail camera, the Command Pro just might have all the features you need. And at a great price. In this review we will give you the results of our research into this camera. We will look at the picture and video quality, trigger speed, what kind of settings and features the camera has, along with any areas that the camera really stands out or falls short. If you are interested in a particular feature check out the table of contents below to jump right to the appropriate section, or else read on to learn more about Browning’s Command Pro Trail Camera. 1.8 What Does it Come With? Browning’s Command Ops Pro has a 55 degree field of view, which is a fairly large viewing area for a trail camera of this size. In that field of view the camera takes still photographs at 14MP, with an effective pixels of 1920 x 1080. The resolution in effective pixels can be a better gauge than the MegaPixels (MP) for trail cameras because the MP number can be inflated with using more pixels but those pixels doing nothing to increase the resolution. You can see this for yourself when you zoom in on a picture and begin to find areas of a picture that are just ‘filer’ color instead of capturing more detail. 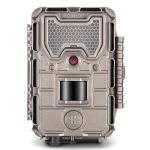 Videos are shot with the Command Ops Pro at 720p and 50 Mbps compression and like most modern day trail cameras it records in sound. The best feature of Browning’s Command Ops Pro is the quality of it’s day time photos. For an entry level camera the photo quality is excellent. While the 14MP might look initially to be lower quality than some of the 20MP trail cameras available, the pictures it takes are just as good. While there can a loss of some details, you should have no problem getting some nice shots of wildlife during the day with this camera. The colors in the photo’s aren’t as crisp as you might find in some of the higher end Browning cameras, but it does do a great job at taking clear photos, even of moving animals. It’s night photography is another story. The quality of the night photographs is on the lower end of the spectrum for trail cameras. We haven’t come across an entry level, inexpensive trail camera yet that does really well in this area. Between 10 and 50 feet you should get usable night photos, but they have a tendency to be on the grainy and dark. For still photos you have some options for setting up the camera. You can choose either the trail cam or timelapse+ for taking still photos. Trail cam will shoot pictures when the motion sensor is triggered. In timelapse+ you can set an interval for when photos will be taken, and in between the set times the camera will still trigger for motion. The Command Ops Pro allows you to choose between a number of preset intervals. The camera will take pictures at intervals of 5, 10, 20, 30 or 60 seconds; or else at 1, 2, 5, 10, 30 or 60 minutes intervals. You also have the option of choosing when during the day the time lapse mode will be active. You can choose between an All Day mode, which will take pictures at the set interval from sunrise to sunset. Or else, you can choose the 2, 3 or 4 hour duration. With these options the camera will take pictures for the set amount of time in the hours after sunrise and before sunset. If you want to get a good idea of what is going on in a field the timelapse+ mode is great for getting a bigger picture of what is happening, especially the hours around dawn and dusk when crepuscular animals are most active. Unlike some other trail cameras that give you the option to do interval recording during any time of the day, the Command Pro Plus is limited to only allowing this feature to work during the day. If you are looking for an entry level camera that will allow you to do surveillance of an area at set intervals at night you will want to try a different camera. 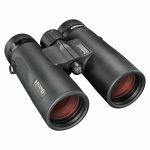 We reviewed one by Bushnell that we think would be better for you if this is a feature you are looking for. In the trail camera mode you have the option of setting up a delay between trigger events. Those are the time increments that could choose between for the timelapse+ mode (1, 5, 10, 20, 30 seconds and 1, 2, 5, 10, 30 and 60 minutes). Using the delays can save you some space on your memory card and reduce the number of photos you might get of the same animals. For each trigger event you can choose to have multiple pictures taken. There are options to choose between 1 and four pictures taken at 2 second intervals in the multi-shot mode, or else at .8 second intervals in the rapid-fire mode. One of the drawbacks that we encounter while doing our research into trail cameras is that while we do hours of research into reviews and details about the cameras, we don’t always get to physically use the cameras. Sometimes this means we come across information we just don’t quite understand. For the Browning Command Ops Pro were perplexed by the Browning Buck Watch Timelapse viewer software. From what we gather the software is necessary to view still photos taken with the Timelapse+ mode, but it also seems that the software is only available for Windows XP. This could be a problem for people who use Mac or Linux computers, or who want to view their timelapse photos in the field using a card reader. Video is much more straight forward with Command Ops Pro camera. Unlike some other trail cameras there is no choice between high and low quality videos. The only choice you have is in the recording length for each video. Browning’s Command Ops gives you the option to record for 5, 10, 20 or 30 seconds or for 1 or 2 minutes. Recording 20 second videos and using a 32GB SD card you should be able to record a little under 500 videos before the card is full. Browning’s Command Ops Pro has a .5 second trigger speed. A half second trigger speed should be more than enough for the trail camera to capture a photo of an animal that has entered into the camera’s range. The trigger speed is the amount of time that passes between the motion sensor being activated and the camera taking a picture. Obviously, the faster the trigger speed the better, especially if you are looking to photograph animals that are just passing by and aren’t stopping to feed in an area. Between each trigger event there is a default delay, or recovery rate, of about 2 seconds, this is sort of the time that it takes the camera to activate, take a picture or video and then be ready to detect movement again. You have the option of choosing a delay of 1, 5, 10, 20, 30 seconds and 1, 2, 5, 10, 30 and 60 minutes. You might want to use a delay if you are concerned with getting too many pictures of the same animal, and filling your SD card with almost duplicate images. When you use delay though you do run the risk of missing an event that could occur in the camera’s inactive times. So setting 30 or 60 minute delay could cause you to miss exactly what you were looking to record. The Browning Command Ops Pro trail camera has an Infrared Detection of about 70 feet, although most people find that the real effective range is closer to 50 feet with a decrease in effectiveness between 50 and 70 feet. The camera comes with a motion test mode, so you’ll be able to see exactly what the effective range of the camera is when you are mounting it. In this mode there is a red LED that will light up when motion is detected. This is a nice feature because it will allow you to see exactly how far the camera is going to be effective with an easy to spot LED. But, when you turn off the motion test there will not be a visible red LED that will possibly spook an animal or make your camera for visible to other people. The Command Ops Pro functions best during the day. A lot of the customization settings are designed just to be used during the day, and the quality of still photographs and videos are best during daylight. At night the quality of the still photographs and videos is questionable. The camera has an Infrared Flash. The range of the flash is somewhat limited to about 70 feet. But, without having the option to take photos at night at a set interval, the 70 foot flash range matches up with the detection range of the camera. The flash isn’t an invisible Infrared LED. While this might not be visible to the naked human eye, it is possible that animals could notice it. Browning have a reputation for making high quality outdoor equipment, and the Command Ops Pro lives up to that reputation. The camera is durable, and the cameras shell will protect it from the elements. There are no problems having the camera out during a rain or ice storm. The camera comes equipped with security cable loops on the back of it’s case. With these you can use a steel cable or 5/26″ python cable lock to secure your camera to wherever you choose to mount it. Browning also offers a security box that you can purchase for even extra protection for your camera. We feel like battery life is something that gets overlooked when choosing a trail camera, but then becomes very important once we have set it up and discover that we are spending a ton of money keeping the camera working. That’s not the case with the Command Ops Pro camera. The camera only needs 6 AA Lithium or Alkaline. You can compare this to the 8 or even up to 12 batteries that some other cameras use. While some other companies advertise an unrealistic 1 year battery life, the Command Ops Pro will function well for quite a while on one set of batteries, and still allow you to use the different options on the camera. Actual users of the camera report getting up to 8 months of use out of a single set of batteries and it should easily make it through a season on one set of batteries. Like any device that uses batteries the cold will drain them faster, but we have seen many people saying that they used the camera straight through the winter on just the one set of batteries. 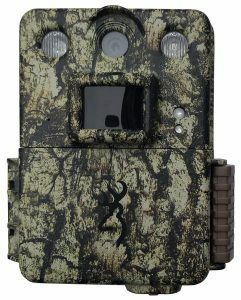 Also, unlike some other entry level trail cameras, the Browning Command Ops Pro also has a 12 volt external power jack, which can give you the option to attach a battery pack for the peace of mind in knowing your camera won’t run out of power anytime soon, or use other options like a solar pack. Customers are generally happy with the Browning Command Ops Pro camera. For an inexpensive camera it takes good daylight photos, and with a long battery life people aren’t complaining about having to put new batteries into the camera every few weeks. The main criticisms are for the quality of pictures and video at night and the lack of being able to set up the timelapse option during the night. When you buy the Browning Command Ops Pro you get the camera, an instruction manual and a 6′ nylon tree strap. You will need to also invest in 6 AA batteries and an SD card. Optionally, you might also want things like a security box, a lock, and an external power supply. The camera is also equipped with a 1/4″ tripod socket, so you can use it with your tripod, or buy one if that is how you are looking to mount your camera. The camera uses up to a 32GB SD card. Online there are a number of people who are selling this camera along with an SD card. This can be a way to save a bit of money. The only possible warning is that some Browning Trail Cameras have problems with SD cards that that a speed faster than 30MB. In our research we haven’t come across anyone having this problem with the Command Ops Pro, but there are reports of this problem for other cameras, that the SD card that gets sent with the camera just doesn’t function well with the camera. 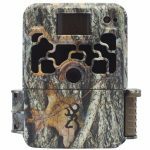 The Browning Command Ops Pro Trail Camera is a great compact entry level camera. With it’s low price and excellent battery life we recommend this camera for someone interested in taking day time photos of the animals and their activity in an area. 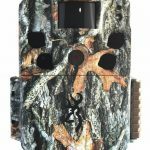 For the price, it’s also a great choice if you are looking to purchase a few trail cameras for an area, or as a secondary or backup camera for a higher quality trail camera. Because of the problems with taking night photography, and that it’s not an Invisible IR Flash we wouldn’t recommend this for security. 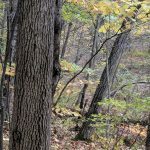 There are better options available if you are looking to use a trail camera to keep an eye on your property or business. We recommend this camera and as long as you don’t expect it to function in some of the ways higher end cameras do, or are looking for high quality night photography you should be quite happy with this durable little camera. To find out more about the current price and get your own visit here. NatureRomp.com is a participant in the Amazon Services LLC Associates Program, an affiliate advertising program designed to provide a means for sites to earn advertising fees by advertising and linking to amazon.com, audible.com, and any other website that may be affiliated with Amazon Service LLC Associates Program.